Making breakfast for 6 people can be a daunting task. Cooking all the eggs, frying the bacon, buttering toast, setting the table, sometimes it’s more work than dinner! 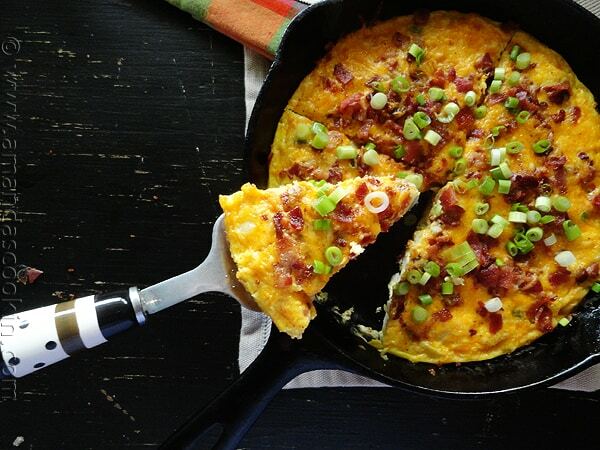 That’s where frittatas come in. 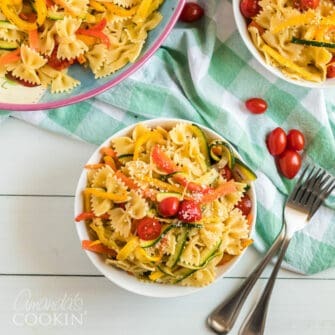 They are easy, don’t require a ton of prep work, and are a real crowd pleaser. 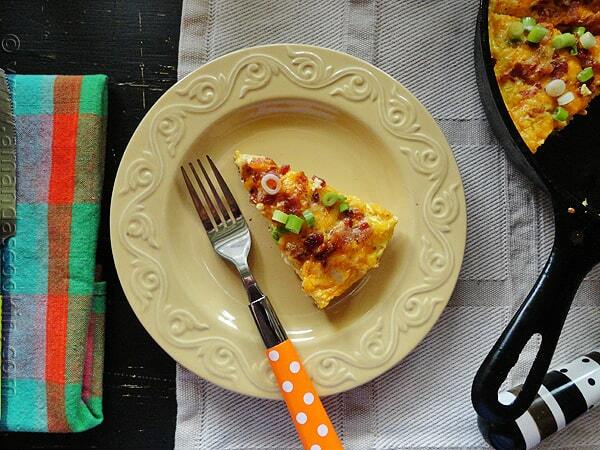 A frittata is kind of a marriage between an omelet and a quiche. The word frittata is Italian and derives from the word fritto, which means to fry. 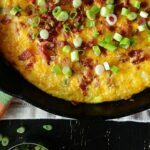 Originally the word was used to describe any type of egg cooked in a skillet, however outside of Italy frittata was used to describe an omelet. 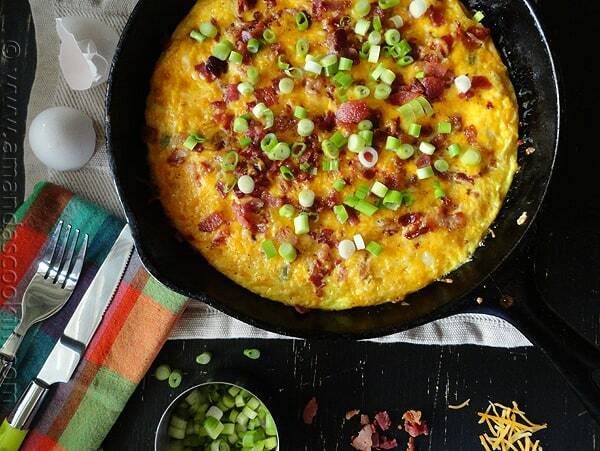 The word frittata has evolved over the past fifty years and the cooking method is different from an omelet in several aspects. 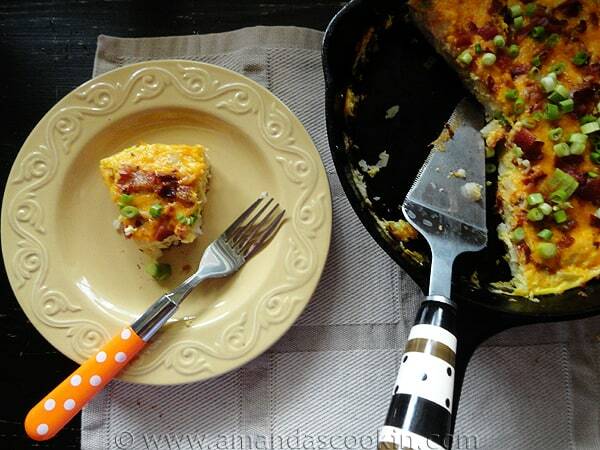 I made this bacon cheese frittata this morning. This one actually uses a nacho cheese, but I’m certain this would be tremendous with Pepper Jack, a Smoked Gouda, or if you’re more traditional, a regular Cheddar Cheese would be great too. My husband and oldest son were leaving so I gave them each a wedge to take with. About ten minutes later my cell phone rang. Silly man. I don’t lose them – I blog them. I just don’t like making things over and over again. I could hear my son in the background saying “Yeah! DON’T lose that one!” And so my friends, I’m not losing this one. ;-) You shouldn’t either. It’ll be here for posterity. A little frying, then dicing, then some more frying. While it’s cooking, you’ll chop a little, then let it cook, garnish, broil, garnish again. Done. 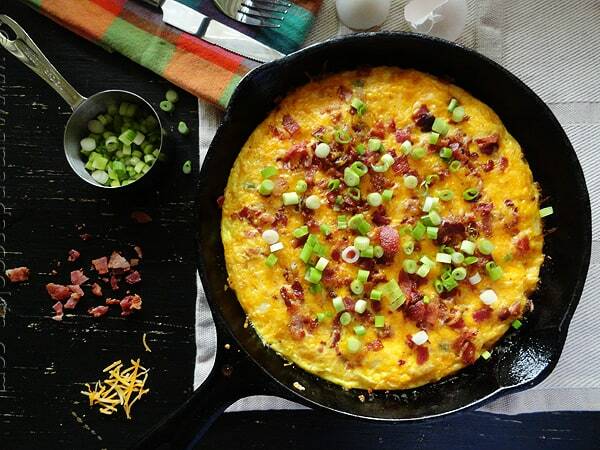 Cook bacon in a 9-inch cast iron skillet over medium heat until crisp. Remove bacon to drain on paper towels; set aside. Scrape the bottom of the pan if needed with a metal spatula. Pour off all but 1 tablespoon of the drippings. Add potatoes to skillet; cook 2 minutes, stirring occasionally. Preheat broiler. Uncover; top with reserved half of the bacon, remaining cheese, then the rest of the bacon. Transfer skillet to broiler; broil 5 to 6 inches from heat for 2 to 3 minutes or until eggs are set and cheese is melted. Garnish with chopped green onions. Cut into 6 wedges.